During 2013, London Transport Museum curators travelled all the way to North Yorkshire to inspect a surprising collection of B-type bus material in private ownership. Amongst the items for sale were four B-type bodies, three chassis, three gearboxes, one engine and a handful of enamel advertisement signs. After careful consideration and further negotiation the Museum acquired all the available material and transported it to the Acton Depot in West London. Items earmarked for restoration were promptly relocated to Haslemere, Surrey, where the work is taking place. Left behind at Acton, however, was an intriguing assortment of B-type parts. 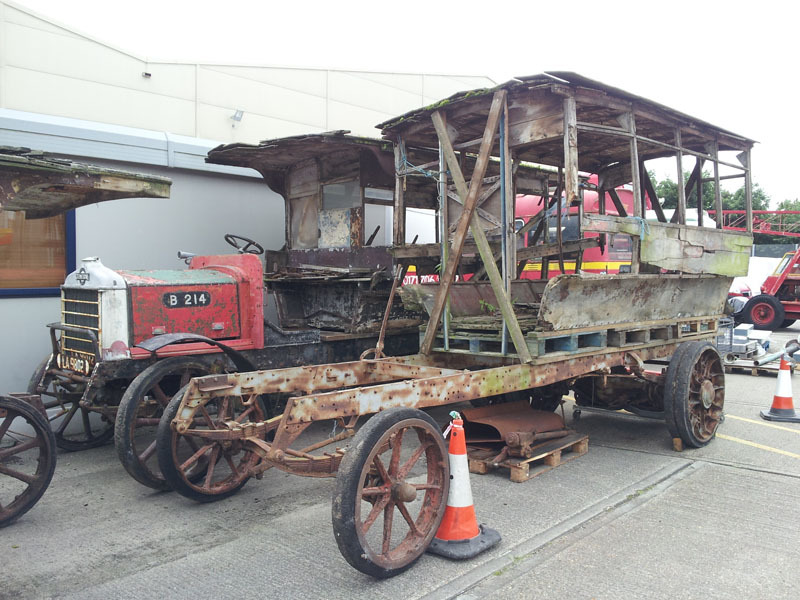 This includes the chassis of B237, the chassis of a Y-type lorry (previously restored as B214), three B-type bodies in various states of decay and items of metalwork which are surplus to the project. Although redundant, leftover items can still be of value and offer crucial information. For example, a saloon interior passenger sign (in too poor a condition to reuse) shows the correct style of lettering which will need to be reproduced. Through the layers of paint it is just about possible to read the text ‘Metropolitan Stage Carriage’ and make out an arrow which would have pointed to the location of the bell used for stopping the bus. Operational reliability is another reason for saving these spare parts. In the case of the gearboxes, the Museum will keep enough key components to assist an overhaul many years in the future. Remarkably, the oldest surplus B-type body might be appropriate for use on the 1906 De Dion chassis that the Museum owns. There are no plans to undertake a restoration at present, but it is interesting to know that there is a possibility for the future. Help us Restore Battle Bus!